Hello, Rubeena here with another 3D card for you. My first one was featured here, using Shoe Wardrobe 2d. Ed. Solid and Outline stamps. I had this idea in my mind for a while and wondered if I would be able to create it. The Mini Wild Florals set is really fun to play with so I started with stamping some solid flowers and ferns with Papertrey Ink and Altenew ink pads. Then I fussy cut them all – yes, this took a while! I think it was totally worth it. You know those acetate sheet packs that have tissue paper between each one? I used that tissue paper for the wrapping of the bouquet. It was easiest to use Zots Bling: Mini Adhesive Dots to layer all the flowers and ferns over the tissue paper. You have probably already heard of the Ken Oliver Crafts Color Bursts. They are highly concentrated pigment powders that are perfect for watercoloring techniques. You just need a tiny amount and some water. There are many ways to do it. What I did was to squeeze some powder onto an acrylic block and add a few drops of water to it to spread the color. I used a wet watercolor brush and started to color Tim Holtz watercolor paper. Look how vibrant that blue is! I used Ultramarine Blue for the background. After it dried, I added drops of water and some sprays of black, white, and shimmer mists to it. I die-cut it so it was 4″ x 5.5″ and attached it to A2 size black cardstock. The final touch was the sentiment. 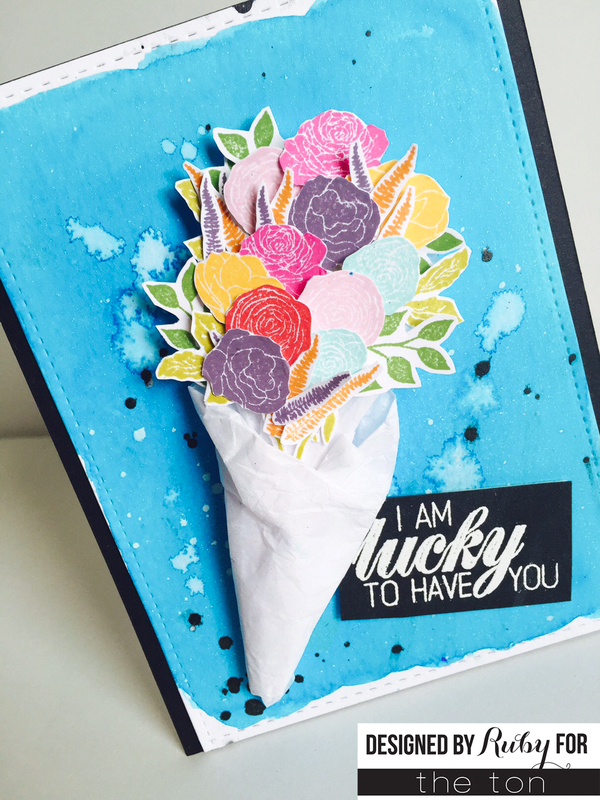 I stamped “I am lucky to have you” from I Got You onto black cardstock with VersaMark ink and heat embossed with white embossing powder. I cut out a rectangle and added it next to the bouquet with foam tape. Thank you for visiting. Hope you liked my card! 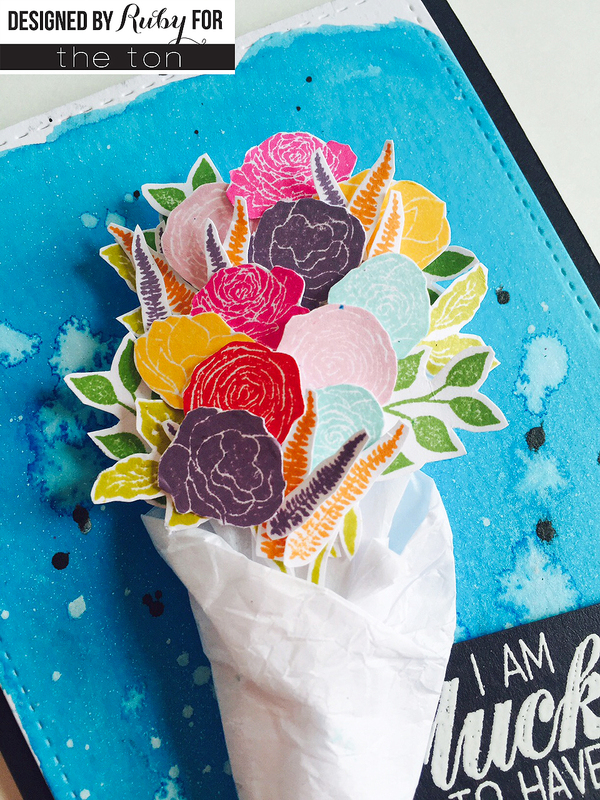 Such a beautiful bouquet, and I love the background you created! The 3d on this is just such a good idea! I love how it turned out. So clever! Gorgeous!! Love the blue background with this bouquet! Well done, Ruby! Look at the WOW 3-D card Rubeena made for The Ton! Oh. my! Gorgeous bouquet and background! Fantastic bouquet! Wonderful flowers and love the wrapping and background!